Natural Oils and Conditioners for Hair Health. Have you Ever Had Silicone Free Hair? Almost all commercial conditioners and “hair oils” have one ingredient in common. Silicone. Check your ingredients for anything ending in “cone” and that’s your silicone way up high in the list. Silicone is a clear lubricant and coats the hair to make it feel slippery and smooth, which people feel is “conditioned.” Silicone tends to build up on the hair which is why it can start to feel dead and rough, and then requires a rinse to remove the build-up. Raw Coconut Oil has shorter chained fatty acids making it a great conditioning ingredient alone, or when added to our other ingredients. 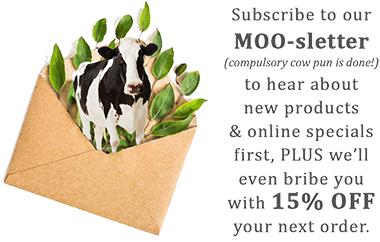 At MooGoo we make original formulas from natural ingredients and never use synthetic addatives in our skin or hair products. That is why you will find nourishing oils instead of silicone in our Protein Shot. Oils like Coconut Oil that penetrates hair well due to the shorter chain length of the molecule (hair is not easy to penetrate.) We have also used oils like Jojoba Oil as it is smooth and slippery but doesn’t build up. We have used Olive Oil because it is a great oil for dry hair. Milk Protein to help prevent split ends. We also add Panthenol and Natural Vitamin E.
So much good stuff! We hope your hair enjoys. After towel drying your hair, rub a pea sized amount through the ends of your hair and blow dry. Can also be used on dry hair.